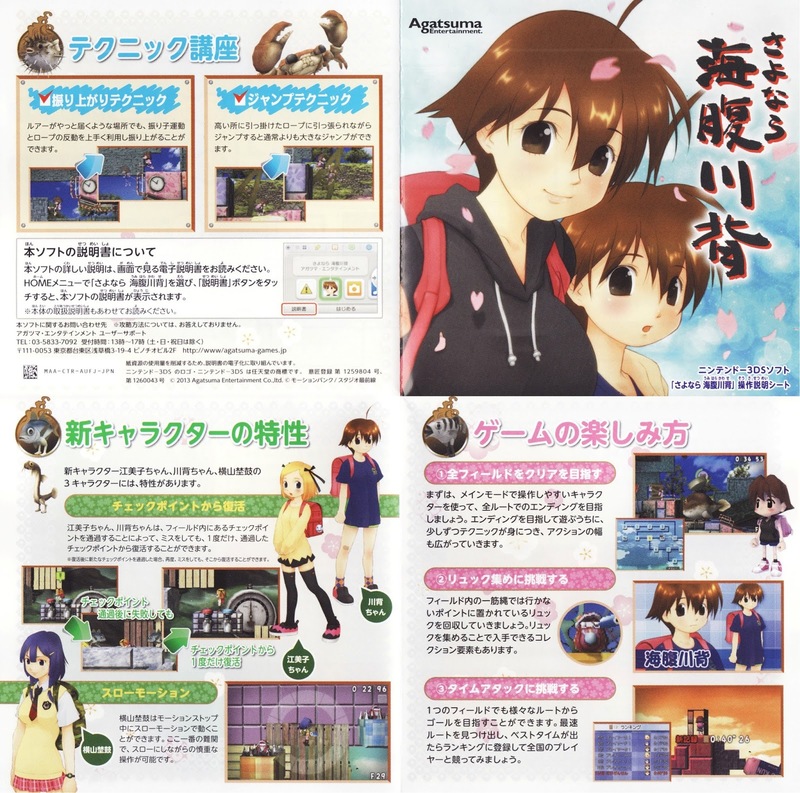 Late last week I published a "Manual Stimulation" post devoted to this game's predecessor, Umihara Kawase Shun for the original PlayStation. Yep, the scans above and below are the extent of this import-only (for now, hopefully) 3DS title's instruction "manual." I know things could be far worse--publisher Agatsuma Entertainment could have simply included a slip of paper directing players to the game's digital manual--but I still wish they'd decided to give us something a little meatier. That said, I'd be lying if I claimed I was upset about having to scan just two pages rather than 30 or so for this particular "Manual Stimulation" installment. Interesting. The weird thing to me about this is that they've plainly made 8 pages sized to fit a regular DS/CD-type booklet. The thing that really makes it seem cheap to me is that the only difference between this and an 8-page booklet is two cuts and a staple, how much could this possibly be saving them? By the way, if you were curious at all (I compared them, hehe), the Second Edition manual is page-for-page identical to the manual you scanned, except for the dates of publication and the little ad on the last page for the strategy guide is missing (the enemy art is resized/replaced to fill the extra space). Yeah, that *is* an interesting/weird thing to note, Michael. 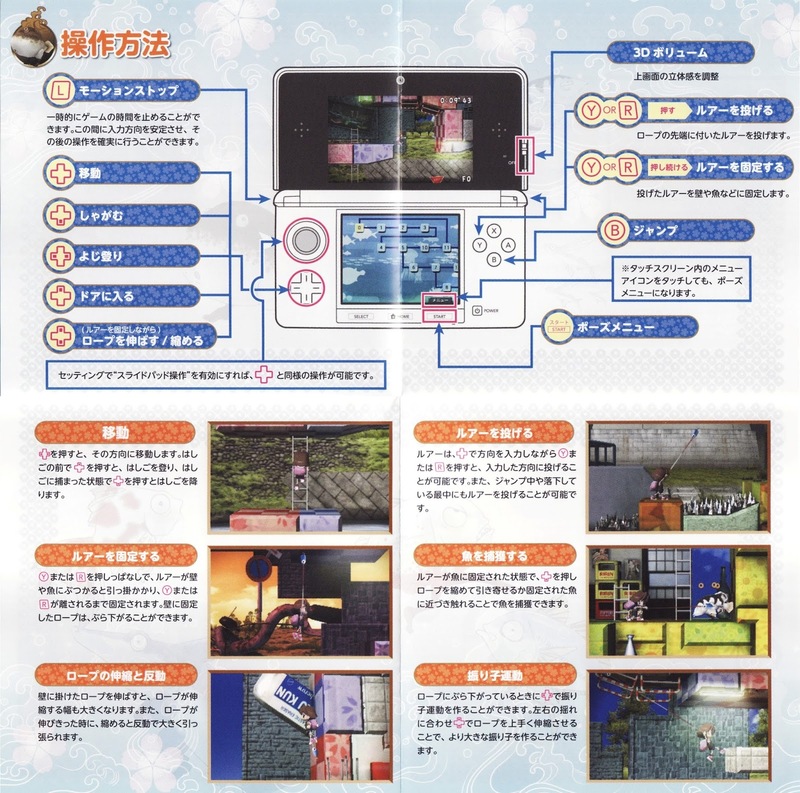 I wonder, then, why the folks at Agatsuma didn't just go for an actual manual? Also, thanks for letting me know about the Second Edition manual. Seems kind of lazy, doesn't it? Although I can't fault them for just going with what they'd already probably spent a good bit of time creating for the earlier release. heh right away I noticed a 4 way fold. Its like a kids mothers day card made in school. Although it looks like the game dos'net need that much explaining. You're right that it likely doesn't need too much explaining, but neither did the previous entries in this series and they had nice, long manuals. This seems to be pretty common these days -- the JP version of Project X Zone is exactly the same format, anyway. Yep, I agree, Jason. The 'manual' for Touch Detective: Funghi's Big Breed is the same, too. Sigh. It's common btw, (I'm repeating everyone here) for all game in 3DS, it's Nintendo Innitiative to reduce paper use. 7 of it was 4 folded, 2 of it was 2 folded, 1 of it was a card, 2 of it was a book. Good going nintendo, I'm gonna waste another electricity to read more manual. Yeah I appreciate it too, although I kinda felt it reduce the value of what the physical boxed game would have.